Liquid Leather Conditioner houdt uw leer zacht of brengt nieuw leven en originele geur in uw oude leer. Ook voor onderhoud van nieuw leer en een must na iedere grondige reiniging. 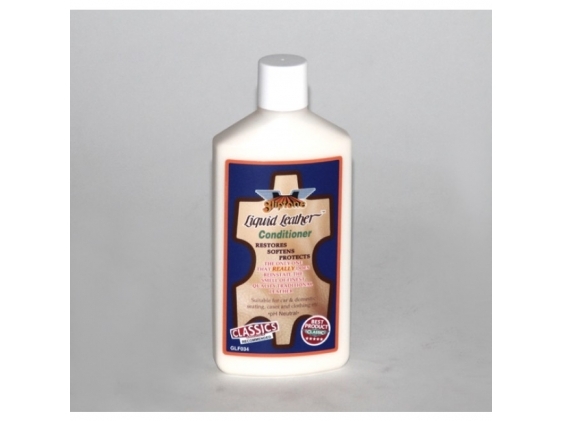 Now you can fully restore the softness and sheen of beautiful leather in minutes. The gentle Liquid Leather Cleaner (250 ml) removes years of dirt and grime to reveal the original beauty and grain of your upholstery and trim without the use of harmful chemicals or water. Follow with Liquid Leather Conditioner (250 ml) to replace the delicious aroma of new leather. You can also use it on leather clothing and furniture.